Riverkeeper just put together their summary of the Roe Jan in 2018, based on the sampling done by RJWC citizen science volunteers monthly May through October at 14 sites. And again, the Roe Jan has some of the lowest Entero counts in the Hudson Valley. In wet weather, sites sometimes exceed the EPA criteria, but in dry weather, the Roe Jan shows that a major Hudson trib can meet the EPA criteria for safe water contact. Pay close attention to the fourth page, which summarizes our three years of sampling on the Roe Jan. In the table we used initials for privacy. Seven to ten days prior to the sampling date, we’ll start organizing the equipment drop off. Details vary slightly between downstream and upstream, but in both cases everyone involved will get connected on an email thread, and we’ll work out the details of a convenient time/place for the gear to be dropped off. On the day of sampling, you will need to supply a cooler with ice. Either a hard frame cooler or a styrofoam (limited reuse) is ok, but if styrofoam, you’ll need to line it with a heavy black garbage bag, to prevent light leakage. The two people sampling will need to work out who supplies the cooler, and also who drives. The sampling kit includes a sampling book, which contains details of the actual sampling, plus maps and information about each sampling location. It would be good to get familiar with that info prior to the sampling day. Suarez Family Brewery, 2278 U.S. 9. Suarez Family Brewery on Google Maps. NOTE: the best way to find the brewery is to enter “Suarez Family Brewery” into your GPS. Many GPS devices will take you to the wrong place if you enter the street address. Suarez opens to the public at 1pm, so we won’t keep you too long, and you are encouraged to stay for refreshments. RJWC is changing its structure. We are gaining a board, and specific officers. If you want to take a leadership role, get in touch. Now is a really good time to step up. We are also looking for input on, well, everything. Comments and suggestions encouraged. We’ll sign up for 2018 sampling dates, and we’ll go over tweaks to our sampling methods and locations. Even if you have sampled before, it would be good to go over things. Sampling is divided into upstream and downstream segments: upstream is Hillsdale down to Gallatin and then Academy Hill Rd. ; downstream starts in Elizaville, continues to the RJ’s mouth on the Hudson, and then two Hudson waterfront sites. Sampling is a full morning 2-3 hour commitment downstream, 3+ hours upstream. We need two people for each date and for each segment. If you want to sample but can’t attend, write to me with availability on the above dates. I know schedules are tight, but this one counts. Please try to attend. We recently posted our own summary of 2017 work and sampling and Riverkeeper produced two brief reports on the Roe Jan based on our citizen science. Save the Date – Oct 21 at 4pm. 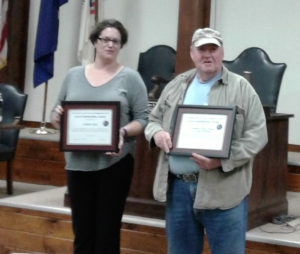 On May 22 the Columbia County Environmental Management Council presented its Good Earthkeeping Award 2017 to two close friends of the Roe Jan Watershed Community. In the individual category the award went to Colleen Lutz. She was cited for her work on the Ancram Conservation Advisory Council, and also for her work on the Ancram planning board. As one of the key members of the RJWC, Colleen organizes our WAVE sampling. Her 2016 WAVE report can be found here. Colleen was one of the key players in the RJWC’s 2017’s Student Sampling day, showing the students how to collect and identify macroinvertebrates in the Roe Jan. In the Ancram CAC’s nomination, they noted “Colleen is a quiet, patient and gentle force of nature for natural resource protection in our community.” We couldn’t agree more. Congratulations Colleen. The EMC’s Earthkeeping award for a group went to the Columbia Greene chapter of Trout Unlimited, one of our close partners and an early strong supporter. At the national level TU is an unwavering voice for the Clean Water Act, and locally that has translated into work on fish stocking, culvert replacement, stream restoration, and more. Their on-the-ground knowledge helps channel state funds to the most pressing local needs. And of course, TU is interested in fishing, and they are deeply involved in helping the next generation to be both good anglers and good stewards of the environment. The award was accepted on behalf of the chapter by president Vince Dubois and Wendover (Wendy) Neefus. The Columbia Paper published a great account of Student Sampling Day on the Roe Jan. It was a wet and drizzly day, but students from both Hudson High, mentored by Jim Mcdarby, and from Germantown Central School, accompanied by Envirothon coach Wendy Fieser, endured the elements while learning about the Roe Jan, and also collecting samples to expand our knowledge of the creek. Here’s the article on Student Sampling Day from the Columbia Paper. In the table I used initials for privacy. An important part of the process is to ferry the sampling materials (bottles, gloves, meter, guidebook) from Bard to the people doing the sampling. This takes place during the week prior to sampling, and is arranged as optimally as possible to fit people’s schedules.